May 2018 32 www.sportseventsmagazine.com Small Markets...Big On Sports! Sponsored Content thletes return year after year to catch some rays on the 32 miles of sugar-white sand beaches, splash in the turquoise waters and win their next championship. Gulf Shores and Orange Beach are well- known for their family-friendly atmosphere and top-notch facilities which has sports event planners and athletes clamoring to return or visit for the first time. The Alabama Gulf Coast is experienced with hosting events such as NCAA, SEC, NAIA and USSSA championships and tournaments. The beach destination has proven to increase attendance since many families like to make it a mini- vacation too. The Alabama Gulf Coast is easily assessible by car from most southeast cities. And nearby Mobile and Pensacola airports are only about an hour's drive from the beach for people outside of the region. Most major airlines fly into both, and direct flights are available from some cities. With more than 17,000 rooms avail- able at beachfront condos, private beach houses and national brand hotels, lodging options and amenities are limitless. And you can't beat the view. To learn more about hosting a sport- ing event on the Alabama Gulf Coast, visit GSOBsports.com. 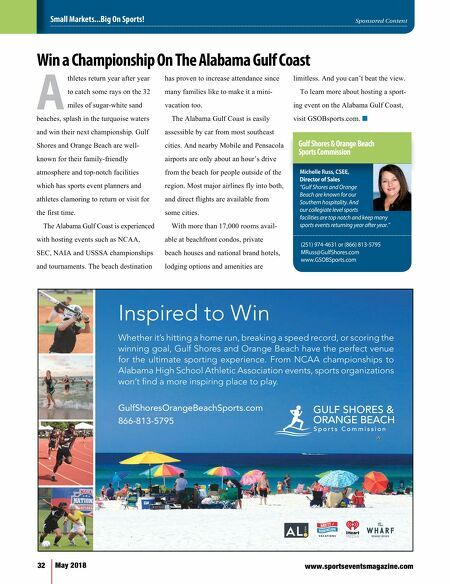 n A Win a Championship On The Alabama Gulf Coast Michelle Russ, CSEE, Director of Sales "Gulf Shores and Orange Beach are known for our Southern hospitality. 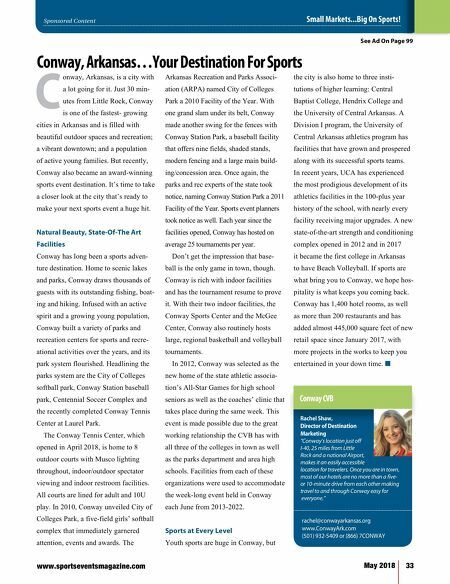 And our collegiate level sports facilities are top notch and keep many sports events returning year after year." Gulf Shores & Orange Beach Sports Commission (251) 974-4631 or (866) 813-5795 MRuss@GulfShores.com www.GSOBSports.com GulfShoresOrangeBeachSports.com 866-813-5795 Inspired to Win Whether it's hitting a home run, breaking a speed record, or scoring the winning goal, Gulf Shores and Orange Beach have the perfect venue for the ultimate sporting experience. From NCAA championships to Alabama High School Athletic Association events, sports organizations won't find a more inspiring place to play.